You can take charge of your life now! You have all the ingredients to succeed in your life. Women Taking Charge: 5 Steps to Succeed in Life and Work is your guide. This book speaks to all women who want to reach their highest job potential, attain better health, gain internal strength and develop deeper self-respect. This slim, information-rich and highly readable book for women contains not only sound guidance, but practical tips, case histories, workbook exercises, resources and a “Five Step Taking Charge” process for dealing effectively and positively with anger. The book also includes a comprehensive list of organizations and agencies that provide support and civil rights information for the reader who plans to take further action to expand her choices—the key to having and enjoying a more fulfilling life. This book has helped thousands of women take charge and succeed in life and work. 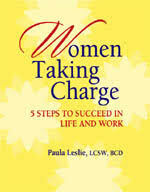 Contact me to order your copy of Women Taking Charge: 5 Steps to Succeed in Life and Work. You will have more control over your behavior if you use visualization to assist you to reach your goal. Visualization will help you stay focused on your goal. The following visualization is not intended to “get rid” of your frustration/anger, rather, it is intended to help you realize that you always have choices regarding: 1) how you respond and deal with circumstances, and 2) how you can reduce stress and continue to be productive. Now, remember a recent situation at work which caused stress for you. Picture the scene as it occurred. Notice what was going on. Pay attention to any tensions in your body as you recall this scene. Continue to visualize the scene in your mind while you take a deep and relaxing breath. As you do this, begin to feel as if a spring breeze is blowing upon you. This breeze is refreshing and light and you feel a sense of calmness all about you. Continue to breathe easily and to relax while feeling this breeze. Begin to picture in your mind that you are walking through a forest. As you continue to breathe, notice the vivid green color of the forest. See the sun peeking through the treetops. See the branches of the trees swaying easily in the breeze. Hear the birds chirping. Feel the breeze blow gently on your face. Now, bringing this sense of relaxation with you, return to the stressful work scene in your mind and continue to repeat the breathing and relaxing technique until you are able to view the scene without reacting with tension or anger. This method takes practice but it is worth the effort. By practicing visualization, you can learn to respond in a more effective way. It is important to understand that you are not ignoring your anger. Rather, you are noticing and accepting it and deciding consciously not to react at the moment. You can process angry feelings at a later time when it is safe and appropriate to do so. The visualization method will help you think more clearly about what you can do to change the situation for your benefit. You are in control of your anger; your anger is not in control of you. —Sid Wilkins, Ph.D., Anger Violence, Workplace Consultant, Chairman – Wilkins and Wilkins International, Inc.
—Sid Wilkins, Ph.D.Anger Violence, Workplace Consultant, Chairman – Wilkins and Wilkins International, Inc. Please contact us for information on speaking, consultations, or the book Women Taking Charge. Call today, or just fill out the contact form and click Send.